"We've actually got a whole 29ft whale scattered around this store," says Jack Ashby, as we enter an average-sized room lined with shelves, drawers and cardboard boxes. The whale to which he refers is a northern bottlenose whale which was shot in Weston Super Mare in the 1920s, and we have little reason to doubt his claim as he gestures first at a whale skeleton on top of a cabinet, and then at a cardboard box marked "whale ribs" in black marker pen. "Although thinking about it," he continues, "I don't recall ever having seen any whale fins around here, and they're pretty important." This is an average working day for Jack. 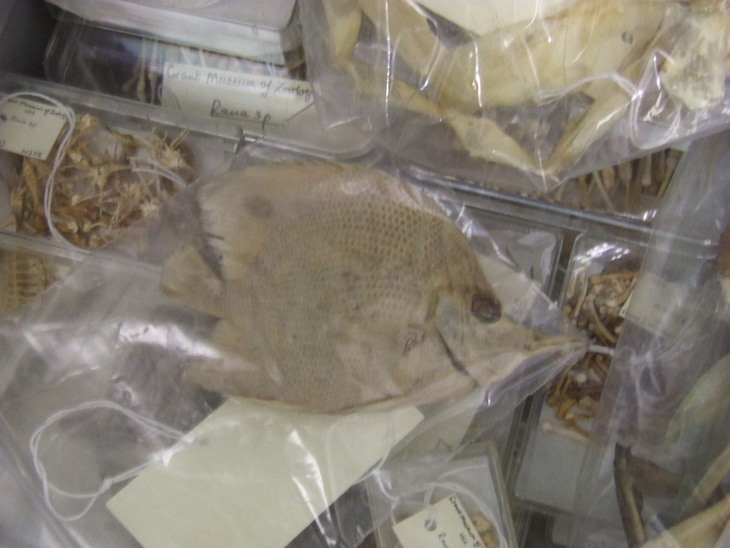 He's manager of the Grant Museum of Zoology at UCL and has kindly agreed to let us peek into the museum's secure stores — the items in the museum's collection which are not on show to the public. 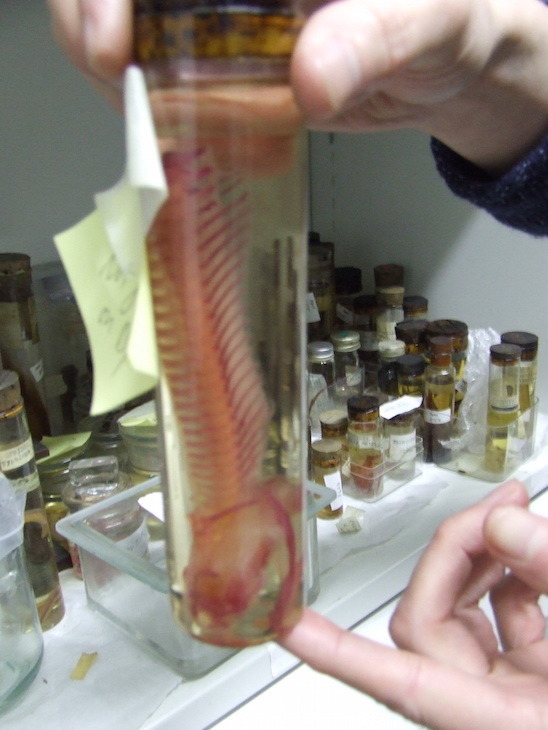 The average museum only has 11% of its specimens on display at any one time. At the Grant Museum, this number is even less, around 7%. Despite this, you can see more specimens in this one small museum than you can in the whole of the Natural History Museum, according to Jack. 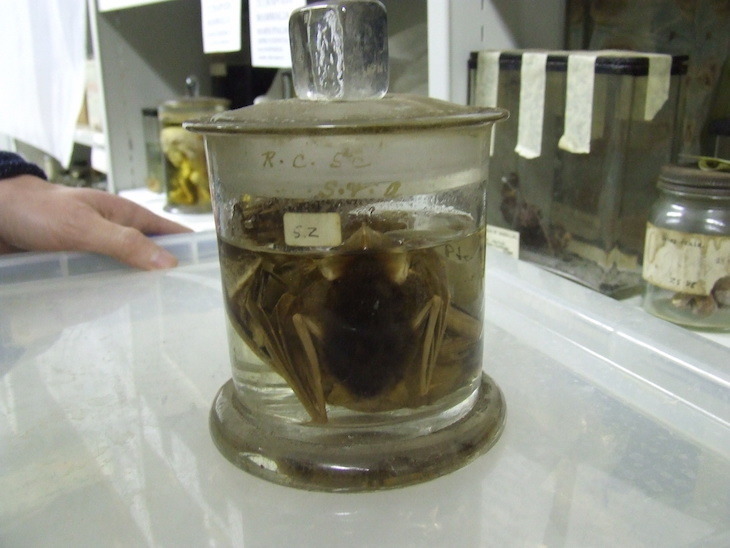 As well as functioning as museum objects, many of the specimens are used for research and teaching specimens for UCL students. At one point Jack looks worried when he opens a palm-sized cardboard box to find it empty, before realising that it's been given — unlabeled — to one of the students. They have a term to use what they've learnt to identify which species it is. When we ask how often items are rotated onto display, Jack laughs. "Every time we come into the store, we find something amazing and end up taking it back to the museum and putting it out." Despite this, the majority of items in storage have never been on display. Aside from the whale, the museum's largest items are all out on display — partly because these are of most interest to the public, and partly for ease of storage. 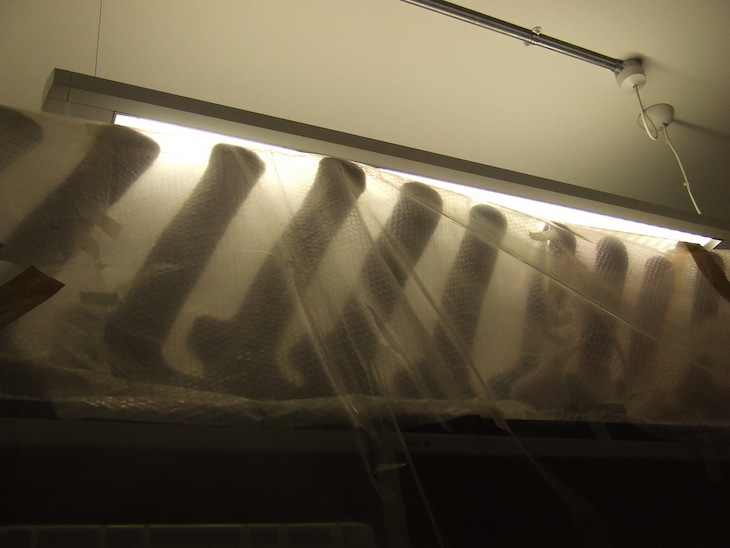 Take a look at some of the things you won't see on your next trip to the Grant Museum. A mini chest of drawers full of toy-sized models of animals which are now extinct. This is an early evolution of an elephant. 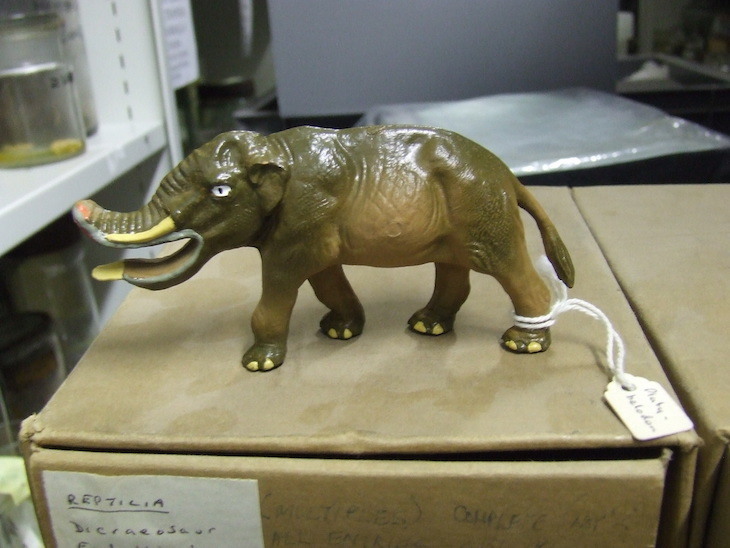 We ask Jack if there's much demand for models of extinct animals or whether the museum has to get them specially made. Apparently they're readily available in the Natural History Museum shop. 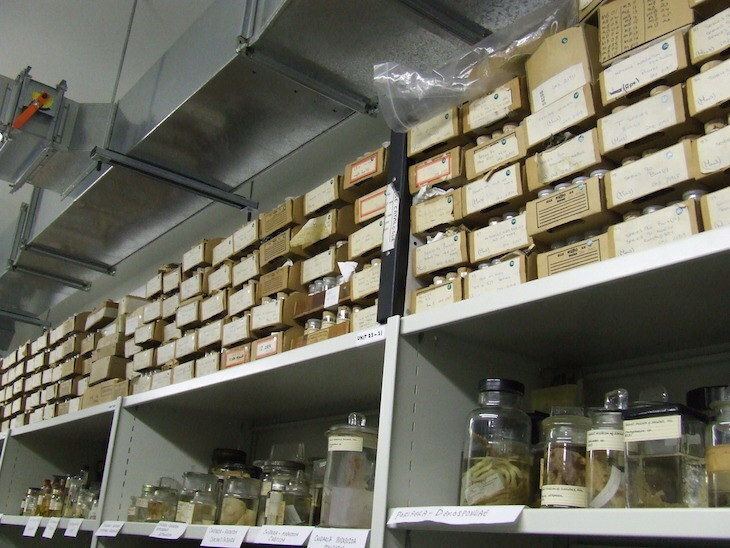 A large portion of the museum's 68,000 specimens are accounted for in these boxes. 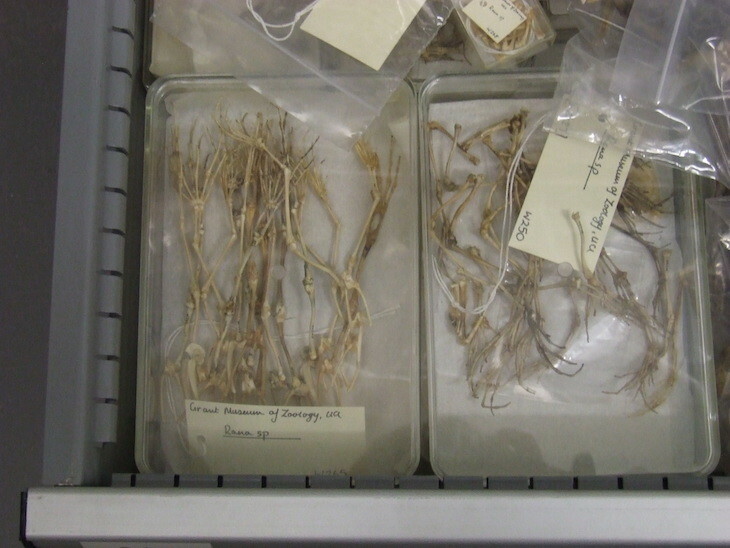 Altogether they contain 9,000 mouse skeletons from islands all over the world, once used as part of a research project. A tortoise shell. 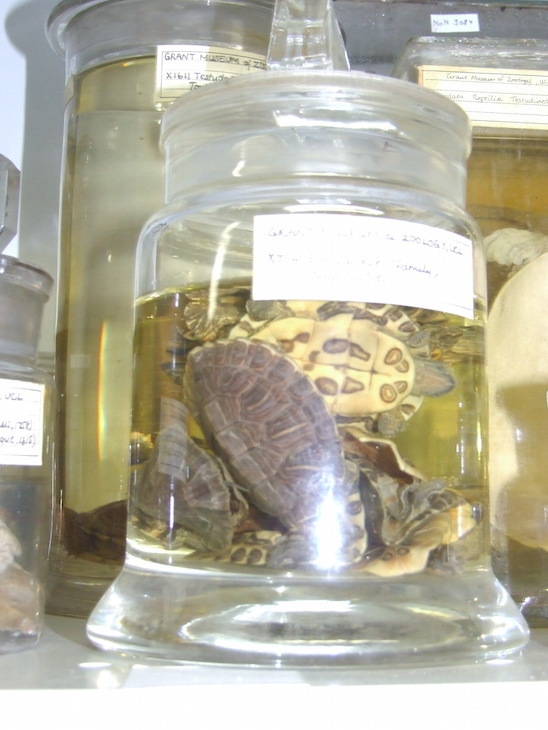 The black lines show the separate plates that make up the carapace - essentially these are fused ribs, vertebrae and dermal bones that are unique to turtles and tortoises. 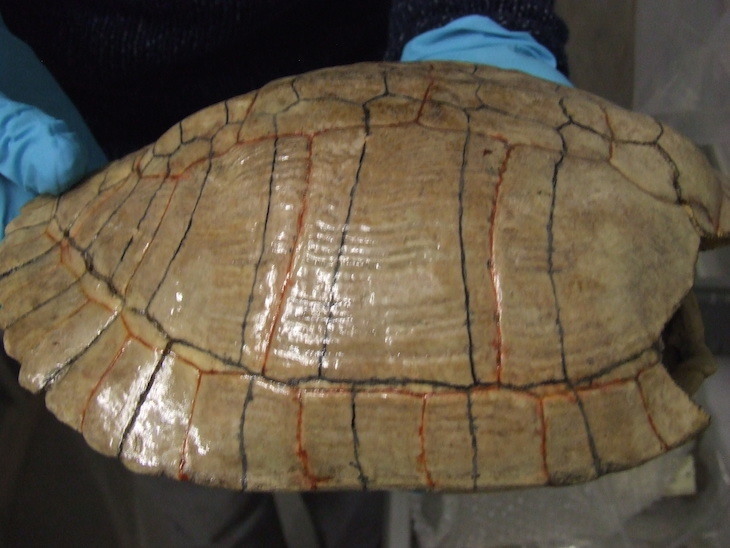 The red lines show where the scutes go - these are the keratin plates that cover the outside of the carapace. 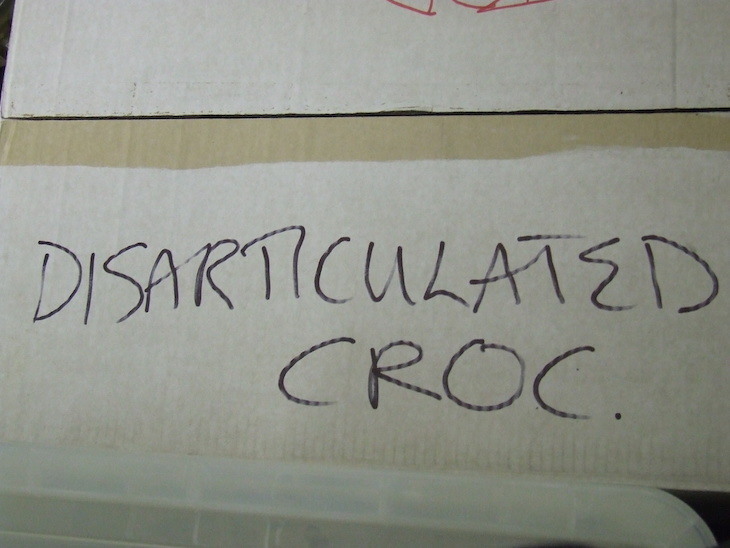 Just one of the many intriguingly labelled storage boxes. 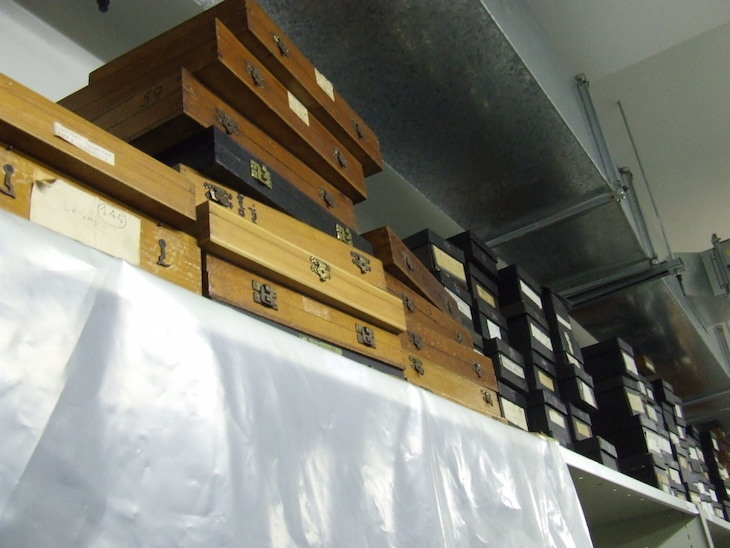 Some of the specimens in storage are currently undergoing the process of Alizarin staining. The soft tissue is stained clear and colourless, and the bones are stained red, so you can see where in the body the bones go. 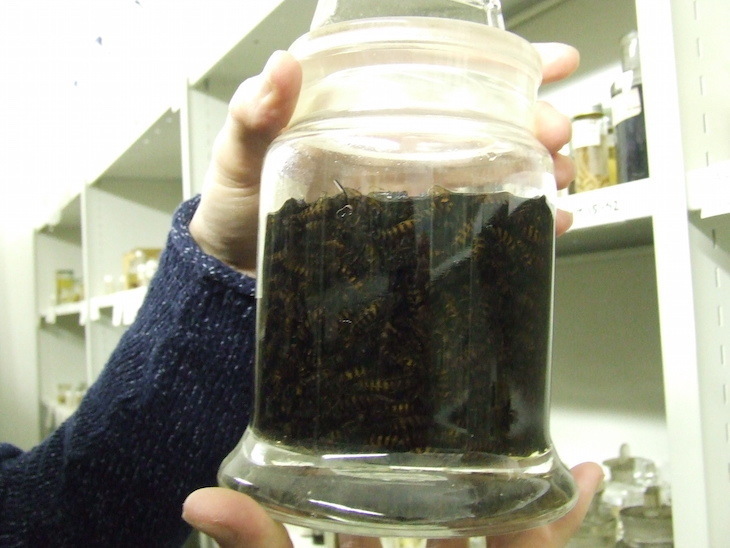 It is hoped that some of these specimens will go on display in the museum in the next few months, once the process has been completed. Ever been to the museum and watched the slides being projected in the slide alcove? These cases are full of many, many more similar slides. 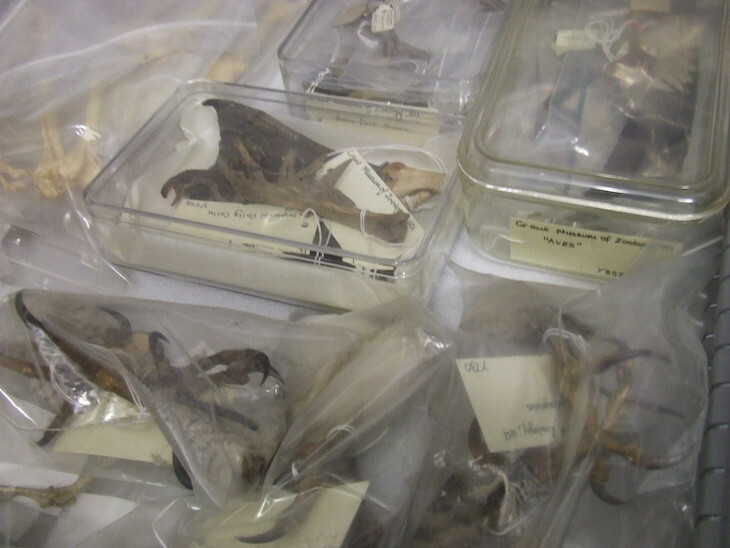 A drawer full of bird feet, many of which were previously mounted and still have the metal pins attached as a result. Is the museum also home to the rest of the birds from which the feet came? Possibly, says Jack, but no-one knows for sure. A drawer of frogs' legs. Even Jack has never seen this freeze-dried rainbow fish before. The process of freeze-drying was pioneered at UCL. 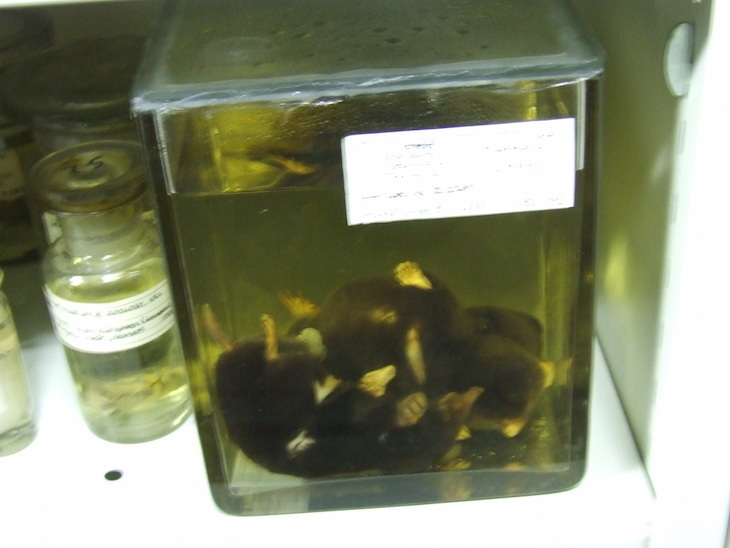 The museum's famous jar of moles (it has its own Twitter account - although Jack is keen to point out that it is run by a member of the public and has nothing to do with UCL) has a rival in the store room - this mini jar of moles (guess they wouldn't all fit in the one jar). 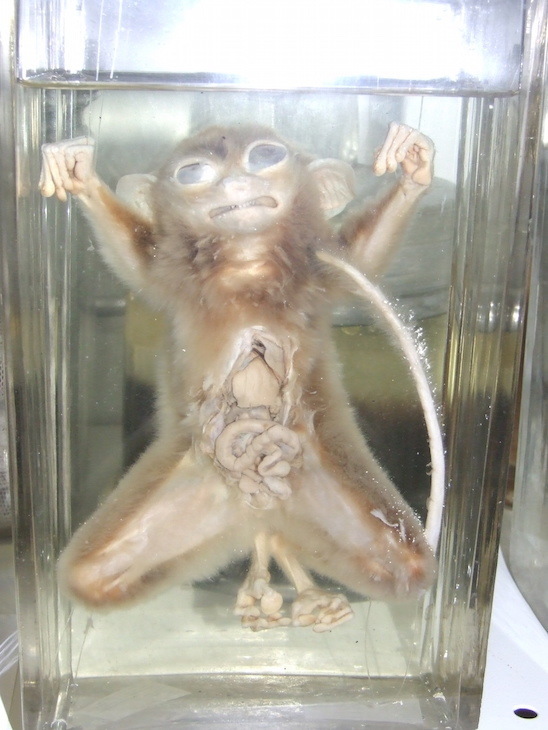 A comically mounted tarsier - an animal from the sister-group to monkeys and apes. 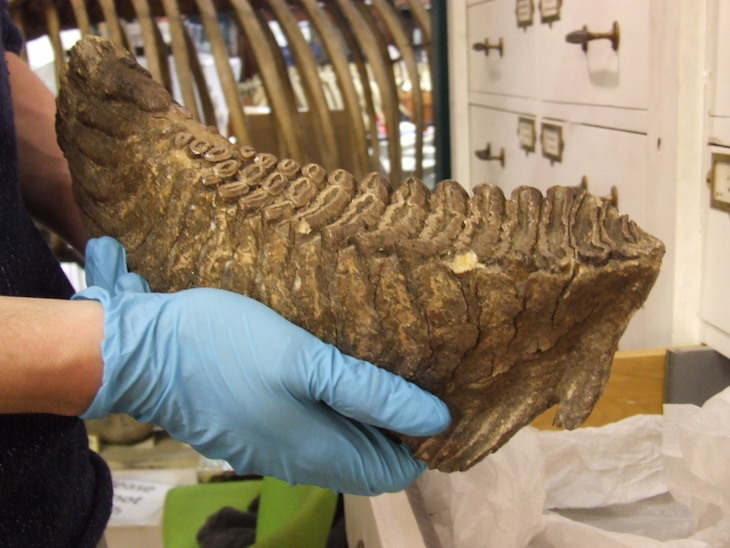 And finally, Jack took us into the museum itself and started rummaging around in the locked drawers - which most visitors don't even notice - before producing this elephant tooth. Yep, that's just one tooth. 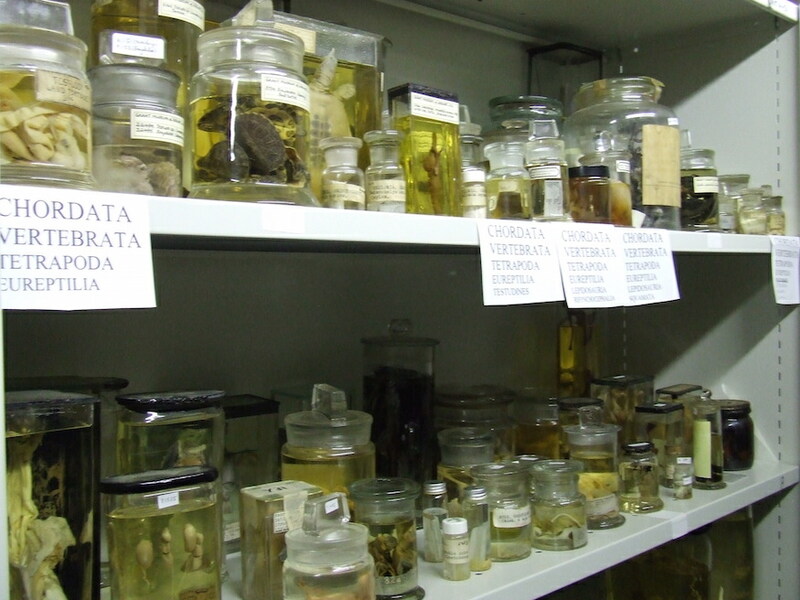 The Grant Museum of Zoology is free to visit and is usually open Monday-Saturday, 1pm-5pm.